No public building works without environmental graphic - however - there might be no other place where people are not so dependable of signature like on airports. Either you look for departure gates, toilets or exits: architecture alone does not make orientation possible. 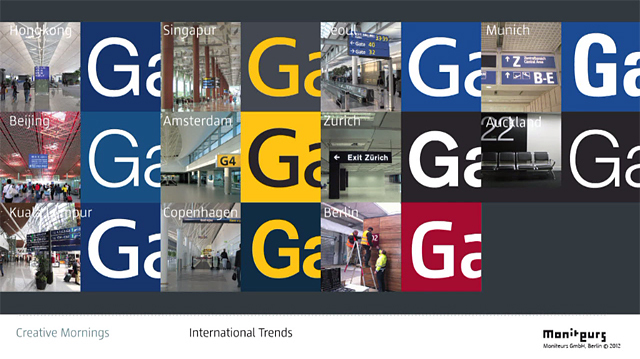 The German design company moniteurs berlin designed, developed and planned the signage system for the airport "Berlin Brandenburg International" which was planned by Gerkan Marg and Partner (gmp) and JSK architects, scheduled to open in summer 2012. Watch their creative morning talk at vimeo to get more insights to the opportunities and threats of wayfinding design. Creative Morning Berlin #6: Heike Nehl, Sibylle Schlaich from Berlin/CreativeMornings on Vimeo.